A team of dedicated professionals work in the Business Management and Analysis Group (BMAG) to provide excellent customer service, insight and commitment to a variety of projects and initiatives across GW. Team members come from a range of backgrounds and have a wealth of experience and expertise. Denita Acker joined BMAG in February 2018 and is currently an Associate. Previously she served as Associate Director of Global and Experiential Programs in the GW School of Business. In this capacity Denita managed the action learning programs for experiential education courses including the Consulting Abroad Program for Global MBAs, domestic experiential programs, and the World Executive MBA international residencies. Her experience also includes serving as Director of Programs at the International Student Exchange Programs (ISEP, an educational non-profit where she increased access to affordable and non-traditional study abroad programs. Denita received her M. A. in International Studies from Old Dominion University. She is a 2019 Professional MBA Candidate at GW. Terrell Allen joined the BMAG team in September 2014 and is currently a Senior Associate. He brings a variety of professional experience to GW. Most recently, he worked in the Finance Division at Howard University where he was responsible for budget planning and management, strategic planning, and business process improvement. Prior to that, he worked for over 20 years as a manager, team lead and analyst in strategic planning, business management, financial planning and analysis and cash management and treasury for a variety of businesses, including Telecommunications, Real Estate, Defense Contracting and Consulting. Terrell earned his B.S. in Electrical Engineering from Howard University, and his MBA from The Wharton School of the University of Pennsylvania. 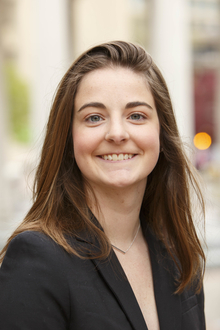 Erin Geiger joined BMAG in September 2015 and is currently a Senior Associate. Prior to joining GW, Erin was with the The Art Institute of Washington for nine years where she managed financial services. Her work there included operational oversight, compliance, financial management and analysis, and business process improvement. Erin earned her Bachelor’s in Art History and Anthropology from James Madison University and an MBA from Argosy University. Haritha Karpurapu joined BMAG in April 2018 and is currently an Associate. Prior to joining GW, Haritha worked on projects involving quantitative and qualitative analytics, product development, and customer satisfaction improvement. With a background in management consulting and engineering, she has worked as a Project Manager in eDiscovery, IT, Education and Automotive sectors. Haritha earned her Master of Business Administration from George Washington University and Master of Technology in High Voltage Engineering from Jawaharlal Nehru Technological University. She is a certified Project Management Professional (PMP). Kaithlyn Kayer joined BMAG in November 2017 and is currently an Associate. Kaithlyn has over 9 years of experience working for GW, most recently with Human Resources as an HR Manager. Her previous roles include Special Assistant to the Vice Provosts for Faculty Affairs and Teaching and Learning at GW and Associate Director of Entrepreneurial Studies at the College of the Holy Cross. Kaithlyn's work has included workforce planning, strategic planning, financial management and analysis, and program development and management. Kaithlyn is a Society of Human Resources Management - Certified Professional (SHRM-CP), she earned her M.A. in American Studies from George Washington University and her B.A. from Salve Regina University. Timothy Sajal Klee joined BMAG in October 2017 and is currently an Associate. Prior to joining BMAG, Sajal worked for the George Washington University Colonial Central office as Assistant Director for five years, responsible for multiple student service initiatives. He began his GW career in January of 2010 as a Financial Aid Officer. Sajal earned his Master’s in Public Policy and Bachelor’s in Political Science and Public Policy from the University of Denver and also holds a graduate certificate in Strategic Public Relations from the Graduate School of Political Management at GW. Pam Promisel joined BMAG in July 2017 and is an Associate. She has over 18 years of consulting experience with both public and private organizations. Pam has experience in business strategic planning, market analysis and strategy, technology research, business process definition and improvement and financial analysis. During her 16 year career at American Management Systems, Inc. (AMS), Pam worked with civilian government agencies such as Office of Personnel Management, Social Security Administration, Environmental Protection Agency, and US Customs. As an independent consultant, her clients included the Board of Veterans Appeals and DC Access. Pam received her Bachelors degree in Computer Science from Brown University. Don Reagan joined BMAG in January 2006 and is currently a Manager. He is a Certified Public Accountant (CPA) and a certified Project Management Professional (PMP) with extensive experience as a manager and team leader across a variety of businesses, including software development, energy trading and senior housing. Some of his previous positions include Corporate Controller, Director of Investor Relations and Finance Director. Don earned his BBA in Accounting from the University of Texas at Austin. Jeremy Rein joined the BMAG team in 2014 and is currently a Senior Associate. Prior to coming to GW, Jeremy served as a strategic project manager at a number of consulting firms across Washington DC, including SRA International, Touchstone Consulting, and JPI. Jeremy’s interests are in strategic project management including improving and implementing organizational performance, designing effective program and project structures, and implementing business process improvements. Jeremy earned his B.S. at Hillsdale College and is a certified Project Management Professional (PMP). Leslie Roe joined the BMAG team in July 2018 and is currently an Associate. Prior to joining GW, Leslie worked at the U.S. Committee for Refugees and Immigrants, supporting the operations and management of domestic refugee resettlement offices. She has 10 years of experience in the non-profit sector where she has been responsible for program management, strategic planning, and financial analysis. Leslie earned her Master's Degree in Organizational Leadership and Learning from GW and her Bachelor's Degree in International Development from American University. Giulietta Versiglia joined the BMAG team in April 2018 and is currently an Associate. She has a background in Marketing and Communications and Business Management. Prior to joining BMAG, Giulietta worked as Associate Director at George Washington School of Business where she was responsible for the operations and budget of the World Executive MBA program. Giulietta has more than 15 years of experience in the private sector, working for companies both in the US and Europe. She holds an International MBA from the University of Kansas and a BA from Wellesley College. Sara Williams joined the BMAG team in December 2016 and is currently an Associate. Prior to joining BMAG, Sara worked for the GW Department of Athletics & Recreation gaining valuable experience in contract processes, financial management and planning, and client service. Previously, Sara worked for the Embassy of Canada in the office of Foreign Military Sales and Defence Procurement. Her work there included financial analysis, office management, and human resources. Sara earned her Master's Degree in Organizational Leadership and Learning from GW and her Bachelor's degree in Business Administration from Saint Joseph's University. Haley Gray joined BMAG in September 2018 as a graduate intern through the GW Presidential Fellow program. She is pursuing a Master of Accountancy degree in the School of Business and will be interning with KMPG in summer 2019. Haley graduated from GW with a Bachelor of Arts in Human Services and Social Justice.